There are train buffs, and there are train buffs - and then there is Walter O'Rourke. On a recent evening in Pennsylvania Station, Mr. O'Rourke, a New Jersey Transit conductor, opened the doors to his train, and a river of elbows and briefcases, knapsacks and newspapers rushed in. His gendarme cap crooked, his glasses bobbing off his nose, Mr. O'Rourke smiled and said, "There's no place else I'd rather be." In fact, there are plenty of other places Mr. O'Rourke, 65, could have been. He could have been at his log cabin in Townsend, Del., which sits on 140 acres. He could have been in one of his two Florida homes, or at his insurance company there. Heck, Mr. O'Rourke could have been off running his own railroad, the one he owns in West Virginia. But there he was, a millionaire from business, real estate and insurance investments, punching tickets on a suburban train full of tired faces, bouncing from shoulder to shoulder like a pinball. No place else he'd rather be. "I don't need the money," Mr. O'Rourke explained. "I need the job." Walter Joe O'Rourke, who never wed, is married to the rails. Despite earning more than what he estimated at $2 million last year from his investments, he chugs along as a conductor, earning a base salary of $52,000 a year. "Pocket change," Mr. O'Rourke said. "But it keeps me doing the one thing I enjoy doing most." Born on Dec. 14, 1939, in Fort Worth, Mr. O'Rourke comes from a family of railway workers. Five of his six uncles worked rail jobs around Texas. Raised in Miami, he joined a workshop at Miami Jackson High School and fell in love with the art of welding, and of cutting steel. "The whole science of machining," Mr. O'Rourke said. "It's somewhat of a dying art these days." As a student at the University of Miami, he volunteered to work at the Gold Coast Railway Museum on campus, spending hours helping to restore equipment and serving as a conductor for the trains that ran on a short piece of track. After three years in the Army, Mr. O'Rourke enrolled in law classes at Little Rock University, now the University of Arkansas at Little Rock. "I knew I wanted to start my own business," he said, "so I just took the courses that I felt would help me in dealing with contracts and related issues." Two years later, that strategy paid dividends. Mr. O'Rourke, age 30 then and working for the state of the Arkansas, invested $80,000 to buy H&W Railway Contractors, a small company that repaired railway tracks in Arkansas and Texas. In 1971, Mr. O'Rourke's train came in. His business was bought by a larger company for $1 million. He began investing in real estate. A large farm in Middletown, N.J., proved profitable. "It made a nice mall," he said. By 1978, Mr. O'Rourke was living comfortably on his investments when he noticed an advertisement in a newspaper: the Arabian American Oil Company was seeking an adviser to the Saudi railroads. With a chance to rekindle his first love, at $110,000 a year, Mr. O'Rourke quickly packed. For 10 years, he oversaw a supply line that carried oil from the Dammam Port, on the Persian Gulf, to Riyadh. While in Saudi Arabia, Mr. O'Rourke also helped build a miniature railroad on the oil company compound in Abqaiq. He built a 150-pound locomotive that ran along 2,000 feet of track, attracting children from Abqaiq and neighboring towns. "In a very strict, very closed cultural atmosphere, the trains were a breath of fresh air," Mr. O'Rourke said. In 1988, he returned to Delaware and his log cabin, with its surrounding land that produces corn, soybeans, walnuts and, thus, another stream of income. 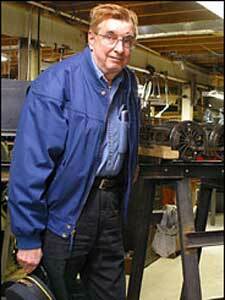 For 10 years he held a low-paying job as a conductor with the Maryland and Delaware Railroad. During that time, however, he invested in the American Shield Group, a brokerage firm in Punta Gorda, Fla., which he owns with a nephew. Mr. O'Rourke said that last year American Shield netted him a $1.6 million profit. In 1997, Mr. O'Rourke realized his ultimate dream. He became the majority shareholder in Durbin & Greenbrier Valley Railroad, a 112-mile stretch of track that runs along the Cheat River in West Virginia. The railroad, which consists of three trains with a total of 14 cars, is used mostly for tourist travel. Last year, he said, it turned a $300,000 profit. "I'm happy, and I'm comfortable," Mr. O'Rourke said. "But I have a high index of comfort." 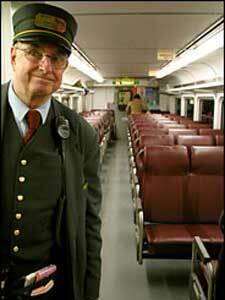 Mr. O'Rourke came to New Jersey Transit in 1999 as a conductor, a job from which he will retire at the end of this month. Asked why he joined, at age 60 and wealthy, he gave an answer befitting two people: the worldly veteran of the rails he has become, and the high school buff in Miami who fell in love with the workshop. "I've always wanted to work on a real, professional railroad," he said. "And these trains can go really, really fast." Garry Sholtis, a fellow conductor on New Jersey Transit's North Jersey Coast line and a train buff himself, said he could relate to Mr. O'Rourke's enthusiasm. "I once read somewhere that there are three jobs people would do for love and not money," Mr. Sholtis said. "The first is a writer, the second is a circus performer, and the third is a railroad conductor." Sitting in his log cabin in Delaware one recent morning, Mr. O'Rourke studied blueprints to restore a 1929 Solarium Pullman Car that he will add to his fleet. "It'll cost $58,000 to truck her from an Oklahoma train yard to West Virginia, and $350,000 to restore her," he said. "But when we're finished making her up, she'll be a beauty." Mr. O'Rourke soon retreated to his 4,000-square-foot, two-level basement-turned-workshop, where he builds model trains that run along some 300 feet of track around his home. He showed off his latest creation, a model of an 1850's-style Baltimore & Ohio Atlantic engine. The engine, like most things running along the tracks of his life, rested at a junction where one man's passion meets his profession. "I realize that some people, especially some of my co-workers, might see me as a strange duck," Mr. O'Rourke said, feeding his new engine a drop of oil. "But where does it say that a man can't love what he does for a living?"